Virtualisation is already a major part of the world of technology as we know it, with the use of virtual servers, virtual desktops, virtual files, virtual networks, virtual storage systems, and virtual operating systems all being commonplace. This has created a huge demand for professionals who are capable of setting up, managing, and creating virtualisation technology. At the forefront of virtualisation is VMware, Inc., a subsidiary of Dell Technologies, who specialise in platform virtualisation services, software, and cloud computing. Being an industry leader in virtualisation, the ability to understand and use VMware technology is much sought-after, so to denote and validate those with the key skills, VMware has established distinct tracks along which people can earn VMware Certifications. These certification tracks focus on five different certifications: Data Center Virtualization, Network Virtualization, Cloud Management and Automation, Desktop and Mobility, and Digital Workspace. Each course features a string of training courses, exams, time to gain experience, and eventual certification. Four of the five tracks feature four grades of certification, from Associate to Design Expert, while the Digital Workspace track is a singular certification course. Here, we’re going to breakdown each of the four stages of VMware Certifications as the majority of the courses follow the same steps and timeframe, as well as divulge more details about the Digital Workspace track, to enable you to get started on the path to being certified by VMware. If you are following the Data Center Virtualisation (DCV), Network Virtualisation (NV), Cloud Management and Automation (CMA), or Desktop and Mobility track (DTM), your first certification will be the Associate Certification (VCA). This is VMware’s entry-level certification and is best suited to IT professionals as well as executives whose job it is to make decisions concerning VMware solutions. En route to attaining this first grade of certification, in each of these four tracks, it is recommended that you undergo the training course, particularly if you’re relatively new to VMware, and then you will be assessed by the VCA exam. Once you have earned the VMware Associate Certification (VCA) of your chosen track, you can start to work towards the next level of certification. This phase of the certification track is expected to take around two weeks to accomplish. 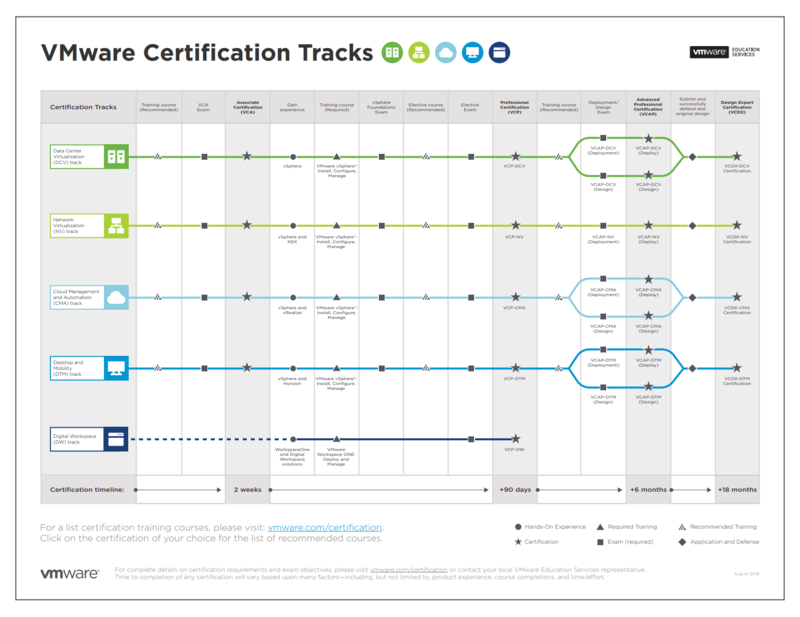 The next phase of VMware certification for the four primary tracks is Professional Certification (VCP). This second tier has been created for IT professionals who manage, install, optimise, and configure the relevant VMware solutions. The first phase of Professional Certification (VCP) is to gain experience. All tracks require you to gain experience in vSphere, but the NV track requires you also to gain experience NSX, CMA seeks experience in vRealize, and the DTM needs you to get experience in Horizon. You are then required to embark on a training course, with participants on each of the four tracks doing a VMware vSphere: Install, Configure, Manage course. Following the training course, you then do a vSphere Foundations examination before taking an Elective course – which is optional but recommended. Finally, you must pass the Elective exam before earning your VMware Professional Certification (VCP). This stage of certification is expected to take close to 90 days to complete. This segment of the certification process, should you choose to continue down the track, is best suited to those who either manage and optimise or design and build VMware solutions. To start the track towards upgrading your VCP to a VCAP, you’re given time to do an optional training course, which is recommended to all. Then, if you’re on the DCV, CMA, or DTM track, you’ll select if you want to pursue the Deployment or Design track. On the NV track, you will train and be examined on deployment. Once you have passed either the Deploy or Design exam, depending on which route you chose to take, you’ll be awarded the VMware Advanced Professional Certification (VCAP). This stage of the certification is expected to take roughly six months to complete. The VMware Design Expert Certification (VCDX) is the highest level of certification offered by the prestigious VMware training and certification programme. This final stage certifies IT architect professionals who prove themselves to be able to manage, design, and build VMware systems and solutions. To do this, you must create, submit, and successfully defend an original design that’s relevant to the track that you’ve completed to the Advanced Professional Certification (VCAP) standard. If you are successful, you are awarded VMware’s highest accolade, the Design Expert Certification (VCDX). This stage is estimated to take around 18 months to complete. The Digital Workspace (DW) track works differently to the DCV, NV, CMA, and DTM tracks in that there isn’t an introductory or Associate Certification (VCA) phase. The DW course immediately places you on the other side of the VCA, requiring you to gain experience in WorkspaceOne and Digital Workspace solutions. Once you have gained the necessary experience, you undergo the mandatory training course, VMware Workspace ONE: Deploy and Manage. After the training course, you take the Elective exam and earn your Professional Certification (VCP) if you pass. There isn’t an Advanced Professional Certification (VCAP) or a Design Expert Certification (VCDX) available along the DW track. The completion of the VMware Professional Certification (VCP) on the Digital Workspace track is expected to take around 90 days. As VMware is a leader in virtualisation, their certifications are held in high regard among professionals of the space. However, as the VMware Certifications are based upon one of the more recent versions of their technology, the certifications will change as the company develops new technology. These certification updates will often come quite some time after the release of the new technology, so keeping up to date with the version focussed on during the various courses is important as they won’t all update at once.